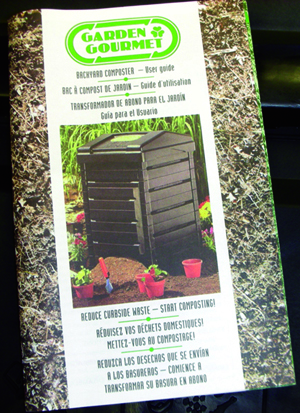 Each composter comes with a user guide booklet with instructions in English, French, and Spanish. (Dalton, GA, May 9, 2013) – Keep Dalton-Whitfield Beautiful is having a Compost Bin Sale during the Downtown Dalton Saturday Market at the Dalton Green. This Saturday, May 11, from 9:00 am to 1:00 pm volunteers will be selling a limited number of the "Garden Gourmet" Backyard Composter for only $45.00 each, almost 50% off the retail price of $79.99. Residents will receive a free perennial with their purchase while supplies last. The "Garden Gourmet" backyard composter is an attractive bin that fits neatly into almost any backyard space thanks to its compact size of 24"x24"x36". The easy to assemble bin is made from 51% recycled plastic and includes convenient features like a sliding bottom door to remove compost. It's an ideal choice for beginners since it includes a basic composting guide. Gardeners refer to composting as "turning your garbage into gold" because it keeps food scraps and organic waste out of the landfill while allowing nature to recycle them into a nutritious soil amendment. Items that can be added to your compost pile include coffee grounds, tea bags, fruit and vegetable scraps, leaves, hair, and grass clippings. International Compost Awareness Week, organized by the US Composting Council, is from May 6 to 11 this year. 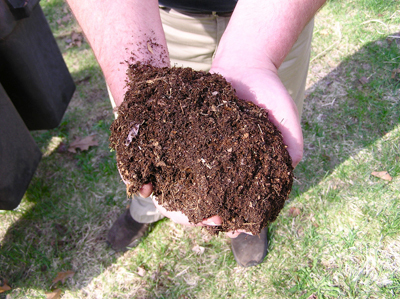 For more information, and to learn more about composting visit the US Composting Council at www.compostingcouncil.org.